This article is in English on purpose because I will share it with the „Getting Things Done® – Network of GTD® Enthusiasts“ group on LinkedIn. Getting Things Done is a methodology invented by David Allen. If you are not familiar with GTD then you should have a look at this GTD introdcution on YouTube, its less than 7 minutes and gives you a good overview. I’m doing GTD for many years now and I tried out several software tools to manage my task lists. Recently I switched my mobile phone from the Blackberry to the Android platform, and so I was looking for a software, that I can use both on the PC and on the smartphone. The tool of choice was ThinkingRock GTD, a software written in Java that I used for a while some years ago, but then switched to Orgmode (Emacs mode). But now I learned the comfort of having your Lists available on the phone by using „ToDoMatrix“ on Blackberry, and I wanted something similar for the Android. So I got the latest version of ThinkingRock and transfered my lists to it. 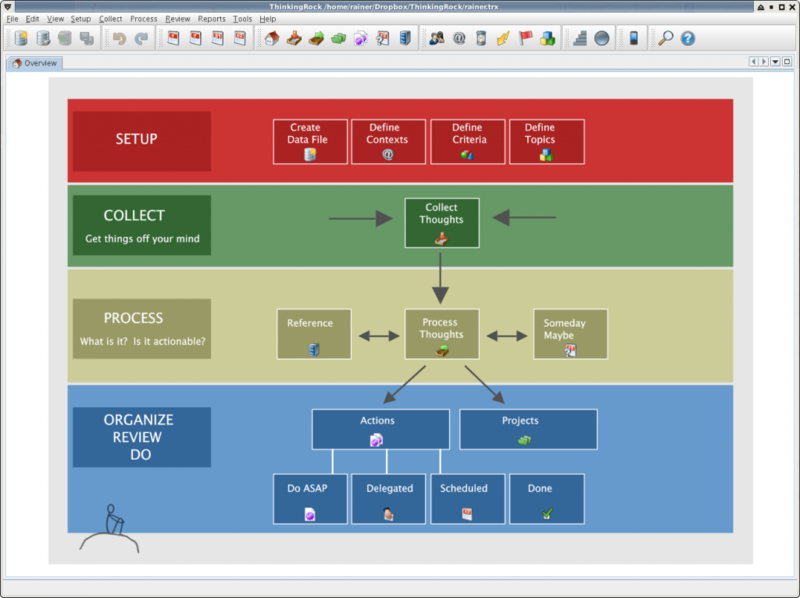 ThinkingRock is a very nice tool to empty your brain and the intro screen shows the workflow. The first step you have to do is setup your environment. You can define contexts, criteria (like priorities or efforts) and topics. When this is done you can start emptying your brain by just collecting thoughts. Just write down what is in your mind without bothering at the moment, if you can do something about it or not. Then, when you want to get started to do things on your list you can process the thoughts. The first and most important question is: „Is it actionable?“, that means is there something I can do now? If so you may create a single action from it or, if you know that it will require more actions you can also create a project from this thought. If its not actionable at the moment, you can put it in the „Someday/Maybe“ list and set a day when it should show up again when processing thoughts. If its really not actionable at all you can just store the thought as „reference material“. Once you are done with processing you have a nice list of projects (many actions for a task) or single actions. This list can be viewed in several ways so that you can e.g. see what you could do if you have 15 minutes of unused time and a telephone. Just select a context phone and tasks with the criteria „effort < 15 minutes“. ThinkgingRock also offers some basic reports as well as the list of „done“ actions that is normally hidden. So if you have (like I need to) to write a weekly report for your boss you just can have a look at the done actions that were finished during the last 7 days. Every action or project has a comment field that can hold text or hyperlinks to web sites. I’m using this to document small progress or unforseen obstacles that keep me away from finishing this task. Of course you can set due dates to your projects and actions and filter for them too. You can also delegate actions, but this is just a reminder for you that you delegated a task to somebody else. It is not supposed to be somehting like a „groupware“ tool, GTD is self management that enables you to get your work done, don’t bother on the tools that other people will use for their work. So far all functions described above were implemented in the desktop software. Now lets have a look at the smartphone software that is available for Android and iPhone. Its not a fully ThinkingRock software, its more a sort of „companion“ or „assistant“ that helps you to put your lists on the smartphone so that you have them with you whereever you go. Its lacking the „process thoughts“ function, but you can still use it to see your action lists and mark actions as done. Or if you have a great idea you can collect this thought also on the smartphone. There is a module that syncs my phone with the PC by setting up a small daemon on a TCP port. On the phone I need to get an WLAN connection to the PC and then the smartphone software can sync with the PC. There is also an option to sync over USB, but I didn’t try that out. The sync software is sometimes doing strange things like not being able to close the „server“ window on the PC without exiting ThinkingRock, but nevertheless I never had data loss with it. When it says „synced“ then it is synced. Another nice feature of ThinkingRock is the ability to set goals. They can be assigned with a goal level, like „situation seen from 10.000 feet above“ or „situation seen from the viewpoint of the worker bee“. You then can assign one or more projects to a goal so that you have an idea why you are doing one project. What ThinkingRock is sort of missing is a sort of „alarm feature“ that reminds you that you need to write the report for your boss every wednesday until 10:00 a.m. Well, the responsibility to do your daily, weekly and monthly review is still yours, so ThinkingRock is a perfect tool to organize your life, but its as loud as a paper calendar. My usual work day therefore starts with a look at the action list to see what I need to do on this day. During the day it may happen that new tasks show up on my radar so I can put them either in Project Lists, or if they are not very clearly defined I can collect them as thoughts. In the afternoon I can do a second review of the day and see, what I really was able to finish. Great tool, highly recommended for people that want to be productive.